It is such a pleasure to share BRIC’s 2018 Annual Report, which celebrates an incredibly vibrant cultural institution at a transformative moment in its 40year history. It is very meaningful for me to reflect with you on the scope of programming highlighted in these pages. Since my appointment as BRIC’s President this past September, which coincided with the launch of BRIC’s 40th anniversary season, I have had the opportunity to meet with hundreds of BRIC partners, community stakeholders, artists, neighbors, and supporters. Through these conversations, I have learned so much about BRIC’s impact. I have spoken to artists whose careers and artistic practices have been energized by a residency at BRIC. I have connected with community media producers whose voices have been amplified by access to our Brooklyn Free Speech platform. And I have heard from new and long-term Brooklyn residents who embrace BRIC as their home for highquality visual art, performances, and family programs. As you look through the enclosed pages, I hope you agree that BRIC is an arts and media organization unlike any other in the nation. Where else but at BRIC does an award-winning digital and television network like BRIC TV, dedicated to telling compelling Brooklyn stories, intersect with exhibitions, public programs, and performance series showcasing the most exciting emerging Brooklyn talent together with global superstars? “BRIC is an arts and media organization unlike any other in the nation.” Where else but at BRIC can you check out equipment and resources to create your own video content for free or take a low-cost media education course, alongside public school students who are discovering their own creative voices as they work with BRIC teaching artists and media makers? This month, I will work with BRIC’s talented Board and staff to launch a human-centered strategic planning process. This process will build on BRIC’s 40-year legacy and chart a path for our future, to ensure we continue to be as relevant and responsive as ever to the communities we engage. A key component of this process will be extending BRIC’s reach. My commitment as President is to ensure that, in the future, all New Yorkers know that BRIC is a place where they are welcome and can experience authentic Brooklyn through arts and culture. I look forward to hearing your perspective as part of this process. BRIC’s accomplishments would not have been possible without the leadership and dedication of individuals like you. I hope you will join us in these important conversations. Thank you for all you do to champion BRIC. And thank you for your commitment to our future, which is more important now than ever as we work to reflect and celebrate Brooklyn’s diversity and richness. BRIC Celebrate Brooklyn! Festival Celebrating 40 years this past summer, the BRIC Celebrate Brooklyn! Festival is a free, summerlong performing arts series. Over ten weeks, New Yorkers come back again and again with their friends and family to appreciate or discover a new genre, acclaimed artist, or world culture each night of the Festival. BRIClab The BRIClab commissioning and residency development program allows eight artistic teams each year the opportunity to explore and expand the possibilities of their work in music, dance, theater, and multidisciplinary performance. 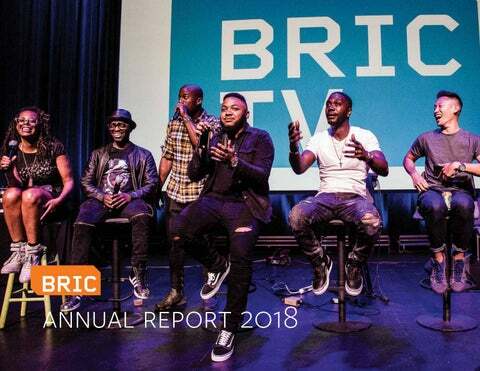 BRIC TV Original Series BRIC TV works with the most exciting filmmakers in Brooklyn to create bold, groundbreaking new work that has been released to critical acclaim on our digital and cable channels. Shows such as Sole Kings, Brooklynification, and The Show About The Show have premiered and screened at festivals such as Tribeca Film Festival, Urbanworld Film Festival, and Sundance Film Festival, among others. Close to 500 individuals of all ages and skill levels attended a series of Community Dance Classes taught by Ronald K. Brown, famed founder and Artistic Director of EVIDENCE, A Dance Company. Blending traditional African dance with contemporary choreography and spoken word, and accessible for all ages and skill levels, these Community Classes were part of EVIDENCEâ&#x20AC;&#x2122;s residency program at BRIC House. 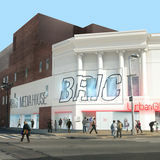 IGNITING IMAGINATION BRICâ&#x20AC;&#x2122;s School-Based Educational Program For the past three decades, BRIC has been a pioneer in providing meaningful art and media education to public school students throughout Brooklyn. Our staff and teaching artists worked with more than 30 schools and 4,000 students in fiscal year 2018, collaborating closely with school administration and classroom teachers to effectively integrate art and media into the core curriculum. BRIC’s 2018 Student Exhibition, INTERSECTION: Individual x Community, showcased a selection of work from schools located in 16 Brooklyn neighborhoods. Featuring a wide variety of media, from sculpture and photography, to film and podcasts, to mosaic and mural work, the exhibition celebrated how young people’s individual expressions intersect with community identity.